This article demonstrates two very different methods of injection: 1) into the brain (intracerebroventricular) and 2) systemic (intravenous) to introduce the therapeutic agents into the central nervous system of neonatal mice. Glascock, J. J., Osman, E. Y., Coady, T. H., Rose, F. F., Shababi, M., Lorson, C. L. Delivery of Therapeutic Agents Through Intracerebroventricular (ICV) and Intravenous (IV) Injection in Mice. J. Vis. Exp. (56), e2968, doi:10.3791/2968 (2011). Despite the protective role that blood brain barrier plays in shielding the brain, it limits the access to the central nervous system (CNS) which most often results in failure of potential therapeutics designed for neurodegenerative disorders 1,2. Neurodegenerative diseases such as Spinal Muscular Atrophy (SMA), in which the lower motor neurons are affected, can benefit greatly from introducing the therapeutic agents into the CNS. The purpose of this video is to demonstrate two different injection paradigms to deliver therapeutic materials into neonatal mice soon after birth. One of these methods is injecting directly into cerebral lateral ventricles (Intracerebroventricular) which results in delivery of materials into the CNS through the cerebrospinal fluid 3,4. The second method is a temporal vein injection (intravenous) that can introduce different therapeutics into the circulatory system, leading to systemic delivery including the CNS 5. Widespread transduction of the CNS is achievable if an appropriate viral vector and viral serotype is utilized. Visualization and utilization of the temporal vein for injection is feasible up to postnatal day 6. However, if the delivered material is intended to reach the CNS, these injections should take place while the blood brain barrier is more permeable due to its immature status, preferably prior to postnatal day 2. The fully developed blood brain barrier greatly limits the effectiveness of intravenous delivery. Both delivery systems are simple and effective once the surgical aptitude is achieved. They do not require any extensive surgical devices and can be performed by a single person. However, these techniques are not without challenges. The small size of postnatal day 2 pups and the subsequent small target areas can make the injections difficult to perform and initially challenging to replicate. The first step is the preparation of the injection stock solutions; these solutions are viral vector, plasmid DNA, drugs, and should be injected under sterile conditions. Mix a desired titer of viral vector (5-7 μL total) with 0.05% w/v trypan blue in PBS for visualization of the injection site. Plasmid DNA solution (5 l μL total) contains D-(+)-glucose 20% (w/v) (1 μL), trypan blue (0.05%) PBS (1 μL), plasmid (˜5 ˜g/˜L) (2 ˜L), and 2.5 kDa linear PEI homopolymer (150 mM) (1 ˜L). Immobilize the PND 2 neonates via cryo-anesthesia for 1-2 minutes. The needle used for this injection is a micro-liter calibrated sterilized glass micropipette that is attached to a 3ml 3 mL Hamilton syringe through a long tube. Break the tip of the needle (with spatula) to adjust for 2 mm penetration into the skull. Place the needle diagonally in the microcentrifuge tube containing the injection solution. Load the injection solution into the needle by carefully pulling the plunger of the syringe. After the uptake of the solution, disassociate the syringe from the tube; pull the plunger up further and then attach to the needle again. Hold the needle in right hand between the thumb and index fingers and place the syringe between the middle and ring fingers with the plunger touching the palm of the right hand. Grasp the immobilized mouse firmly by the skin behind the head using the left hand and place on a fiber-optic light to illuminate relevant anatomical structures that can be used as a guide. Insert the needle 2 mm deep, perpendicular to the skull surface, at a location approximately 0.25 mm lateral to the sagittal suture and 0.50–0.75 mm rostral to the neonatal coronary suture (Figure 1A).Then, push the plunger using the palm of the right hand very slowly and carefully. Monitor for ruptured vessels or facial swelling. Remove the needle 15 seconds after discontinuation of plunger movement to prevent backflow. To recover, keep the mice for 5–10 minutes in a warmed container until movement and general responsiveness is restored. The solution to be injected should be prepared and supplemented with filtered green food dye at 1:100 dilution and injected under sterile conditions. Attach a small plastic luer to the end of a 100 μL glass Hamilton syringe. To the luer, attach a 33 gauge 0.25 inch hypodermic needle. Insure that all parts are securely connected. Load the syringe with the volume to be injected, ensuring that there is no air in the syringe as injection of air into the vessel is lethal. It is often helpful to pipet the volume to be injected unto a piece of parafilm. This allows for the clear visualization of uptake of the solution into the syringe. 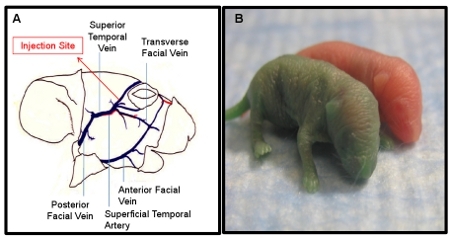 A Wee Sight Transilluminator is used to easily visualize the superficial temporal vein, or facial vein, in the neonate (Figure 2A). Before injection, secure the neonate to the transilluminator using surgical tape. Gauze should be placed between the neonate and the tape to prevent the tape from damaging the skin of the animal. Secure the animal to the transilluminator on its side, ensuring that the tape does not prevent respiration. The neonate’s neck should be gently turned so that the facial vein is easily visible and the nose should be taped to stabilize the head. Using a 2.25X headband magnifier to allow for easier visualization, slowly insert the needle into the vein. The vein is very superficial so the needle should remain visible beneath the skin. Slowly infuse the volume of solution into the vein. The green dye allows for easy visualization of the injection. Wait 15 seconds before removing the needle as there is a lag between fully depressing the plunger of the syringe and the expulsion of the remaining solution due to the extremely narrow needle bore. After removing the needle, use gauze to apply pressure to the injection site until the bleeding ceases. Monitor the neonate for signs of distress. After a proper injection, no overt distress should be observed. The neonate should be given approximately 5 minutes to recover before it is returned to the cage. Flush the needle/syringe unit with PBS in between injections as blood in the needle will quickly clog it due to small bore. ICV injection: The brain can be harvested at different time points post-injection and visualized to demonstrate successful injection technique. If the dye is not added to the injection solution, it will be difficult to check for the accuracy of the injection. Proper injection of one of the ventricles will allow distribution of the trypan blue on the injected side of the brain approximately 10-15 minutes post-injection (Figure 1B). A uniform distribution of trypan blue in both right and left cerebral hemispheres and olfactory bulbs will be visible approximately 60 minutes post injection (Figure 1C). This is due to connectivity of the cerebral ventricles that will permit the dissemination of the blue dye to the adjacent ventricle. Accurate injections can also be visualized by dispersal of the blue dye in the rostral central spinal canal approximately within 12 hours post-injection (Figure 1D). Inaccurate injections can be distinguished by lack of blue color in cerebral hemispheres. In this case, the depth of the needle was not sufficient and the injection solution has probably distributed under the skin. An alternative possibility is that the needle penetrated too deep in the brain, thereby passing beyond the ventricle and the solution is emptied underneath the cerebral ventricles. IV injection: Accurate and efficient temporal/facial vein injection can be visualized immediately following the injection. As the solution is injected, the green dye allows for the visualization of the solution entering and flowing through the facial vein (Figure 2A). Additionally, altered skin color of the mouse will be observed following injection. The neonate’s normal pink color is converted to green, due to presence of green food dye in the injection solution (Figure 2B). The extent of the green color change observed in the neonate is dependent upon the concentration of dye used. For simple visualization of injection and during a practice period, a 1:50 dilution is recommended. However, the dramatically altered skin tone often results in the pup being rejected by the mother and therefore, removal of the dye or a significantly reduced concentration should be considered during experimental procedures. An inaccurate injection will result in the accumulation of green dye under the skin at the site of the injection. Incomplete injection, which occurs when the opening of the needle is not fully inserted within the vein, is seen when some solution flows in the vein and some accumulates under the skin. If this is observed, the needle should be inserted further into the vessel. Figure 1. Demonstration of successful I.C.V. injections in PDN2 mice. A) Schematic of injection sites utilized in I.C.V. injections into the ventricles. B) Brain from I.C.V. injected Pup with trypan blue in PBS on left ventricle, photo taken 15 minutes post injection. C) Brain from I.C.V. injected Pup with trypan blue in PBS on left ventricle, photo taken 60 minutes post injection. D) Rostral central spinal canal is shown in I.C.V. injected pup with trypan blue in PBS on left ventricle, photo taken 12 hours post injection. Figure 2. Demonstration of successful I.V. injections in PDN2 mice. A) Schematic of facial vein utilized for I.V. injections. B) Pup injected I.V. with green dye in PBS compared to un-injected littermate, Photo taken immediately post injection. Research using mouse models of disease often requires the administration of drugs or other substances to neonates. In this video, we demonstrate the step-by step procedures involving two types of injection strategies that can be used to target the CNS: 1) direct injection into the CNS utilizing intracerebroventricular (ICV) injection; or 2) IV injection targeting the temporal/facial vein. The timing of these injections is of great importance. Since the ICV injections are freehand, the skull must be relatively malleable. This type of injection is only possible through the first week of life, and becomes increasingly more challenging and detrimental to the animals as the animals age. However, the primary benefit is that direct delivery to the CNS is achieved, effectively bypassing the blood brain barrier. Therefore, if an investigator is developing CNS therapeutics, it is possible to analyze compounds that are not fully optimized for drug-like properties such as blood brain barrier permeability, however, compound activity can be measured in disease-relevant tissues. Use of the temporal vein during the first few days of life has proven valuable as this is a relatively non-invasive technique for general IV administration. At this developmental stage, no additional veins are easily accessible, such as the tail vein which becomes more accessible during the second week of life 5. Both injection techniques are safe and can be performed freehand, with mice recovering shortly after injection without any detrimental side effects. Both techniques are suitable for rapid injection of a group of animals in a short period of time. They require proper visualization of the targeted area to ensure a successful injection. This is provided by the transilluminator and magnifying headband in IV injection (Table 1) and a fiber-optic light in ICV injection. One of the advantages of IV injection is that a larger volume (100 ∞Ll) can be injected with ˜90% success rate 6. Common problems encountered while learning the IV technique include needle misplacement resulting in subcutaneous injections and/or incomplete injections. These problems can be countered by ensuring the bevel of the needle is thoroughly threaded through the vessel. The needle should be inserted into the vessel far enough that the bevel of the needle is completely surrounded by the vessel. Additionally, the vessel is extremely superficial, thus the injector must ensure that the needle is in the vessel and not beneath it. To check if the needle is in the vessel, after placement the needle should be gently moved side to side. If the needle has penetrated the vessel, the vessel will move along with the needle. If the vessel does not move, the needle is not inserted properly. Performing this check before injection will increase the number of successful injections. Neonatal delivery of AAV9 vectors has been recently utilized to successfully transduce a high percentage of motor neurons using recombinant AAV vectors in SMA mice 7,8. The most important consideration during the ICV injection involves the length of the needle tip. The tip must be long enough such that it can penetrate at least 2 mm in the skull. If the tip is not long enough, the needle will not be able to efficiently enter into the ventricles. Alternatively, if the tip is too long, this hinders the uptake of the solution to be injected and also creates a fragile tip that is difficult to guide correctly through the skull. The angle of the needle is important to ensure exact penetration into the ventricle by holding it perpendicular to the skull with the tip toward the sagittal suture. ICV injections have been utilized in numerous studies to introduce compounds, drugs, therapeutic RNAs, plasmid DNAs, and viral vectors into the CNS of the diseased mice models 4,9-17. However, the limiting factor in ICV injection is the small capacity of the cerebral ventricle in neonatal mice that may not allow penetration of a desired volume of the therapeutic agents. Therefore, the ability to reach therapeutic expression levels using a lower vector dose in a short period of time is particularly important where the delivery volume is restricted. The authors would like to thank John Marston for expert animal husbandry and Dr. Marco A. Passini for technical assistance at the early stages of this project. This work was funded by grant from the National Institutes of Health to C.L.L. (R01NS41584; R01HD054413). Blanchette, M., Fortin, D. Blood-brain barrier disruption in the treatment of brain tumors. Methods Mol. Biol. 686, 447-463 (2011). Foust, K. D., Kaspar, B. K. Over the barrier and through the blood: to CNS delivery we go. Cell Cycle. 24, 4017-4018 (2009). Snyder, E. Y., Taylor, R. M., Wolfe, J. H. Neural progenitor cell engraftment corrects lysosomal storage throughout the MPS VII mouse brain. Nature. 374, 367-370 (1995). Passini, M. A., Wolfe, J. H. Widespread gene delivery and structure-specific patterns of expression in the brain after intraventricular injections of neonatal mice with an adeno-associated virus vector. J. Virol. 24, 12382-12392 (2001). Kienstra, K. A., Freysdottir, D., Gonzales, N. M., Hirschi, K. K. Murine neonatal intravascular injections: modeling newborn disease. J. Am. Assoc. Lab. Anim. Sci. 46, 50-54 (2007). Sands, M. S., Barker, J. E. Percutaneous intravenous injection in neonatal mice. Lab. Anim. Sci. 49, 328-330 (1999). Foust, K. D. Rescue of the spinal muscular atrophy phenotype in a mouse model by early postnatal delivery of SMN. Nat. Biotechnol. 28, 271-274 (2010). Foust, K. D. Intravascular AAV9 preferentially targets neonatal neurons and adult astrocytes. Nat. Biotechnol. 27, 59-65 (2009). Passini, M. A., Watson, D. J., Wolfe, J. H. Gene delivery to the mouse brain with adeno-associated virus. Methods Mol. Biol. 246, 225-236 (2004). Coady, T. H., Lorson, C. L. Trans-splicing-mediated improvement in a severe mouse model of spinal muscular atrophy. J. Neurosci. 30, 126-130 (2010). Baughan, T. D., Dickson, A., Osman, E. Y., Lorson, C. L. Delivery of bifunctional RNAs that target an intronic repressor and increase SMN levels in an animal model of spinal muscular atrophy. Hum. Mol. Genet. 18, 1600-1611 (2009). Coady, T. H., Baughan, T. D., Shababi, M., Passini, M. A., Lorson, C. L. Development of a single vector system that enhances trans-splicing of SMN2 transcripts. PLoS One. 3, e3468-e3468 (2008). Dickson, A., Osman, E., Lorson, C. A. Negatively-Acting Bifunctional RNA Increases Survival Motor Neuron in vitro and in vivo. Hum. Gene. Ther. 19, 1307-1315 Forthcoming. Mattis, V. B., Ebert, A. D., Fosso, M. Y., Chang, C. W., Lorson, C. L. Delivery of a read-through inducing compound, TC007, lessens the severity of a spinal muscular atrophy animal model. Hum. Mol. Genet. 18, 3906-3913 (2009). Williams, J. H. Oligonucleotide-mediated survival of motor neuron protein expression in CNS improves phenotype in a mouse model of spinal muscular atrophy. J. Neurosci. 29, 7633-7638 (2009). Passini, M. A. CNS-targeted gene therapy improves survival and motor function in a mouse model of spinal muscular atrophy. J. Clin. Invest. 120, 1253-1264 (2010). Shababi, M., Glascock, J., Lorson, C. L. Combination of SMN Trans-Splicing and a Neurotrophic Factor Increases the Life Span and Body Mass in a Severe Model of Spinal Muscular Atrophy. Hum. Gene. Ther. 22, 1-10 (2010). Congratulations on this educating paper. Can you please provide more information on the nature of the food dye, i.e. supplier? Thank you. I tried getting a hold of our "librarian" however we no longer have a librarian that can approve this journal. I need to learn this methodology very quickly and would love to view the video. Can you please share this information with me?